Melton RFC survived a tense finale to earn a gutsy unattractive, but deserved Midlands One East win in Northampton on Saturday. Looking for just their second away win of the season, Melton travelled again with a much-changed team due to long-term injuries and unavailability. The situation gave the others an opportunity to show their worth and outline Melton’s strength in depth in both youth and experience. In a game that was heavy going for both players and supporters alike, Northampton started the stronger with determined running. And after five minutes the hosts were awarded a penalty in the centre of Melton’s 22 for not releasing after the tackle (3-0). 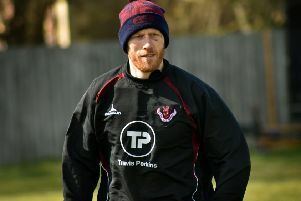 Green was replaced by player-coach Collins soon after following a hip injury, but Melton countered with strong running and tackling in the centre from Radford and Prior. The visitors moved in front after a break-out from their own 22. The ball was moved wide by Rose for Prior and then Radford who released Wood to score the first try after 37 minutes. Cox’s conversion made it 7-3. Melton could have been three tries to the good by half-time, but the final pass was forced when close to the Northampton line, and possession was kicked away too often. Further changes were made at half-time with Belcher on for Evans and Loveday for Osborn. Loveday held his own once more at prop and Belcher was outstanding in pinching the opposition ball at the lineout and creating attacking opportunities. The scrums went with the put-in and as with the first half Northampton were on the front foot for the first 10 minutes. Seventeen-year-old wing Brooks ran the ball back at every opportunity after fielding high kicks as Northampton defended their line. The game was stopped after 55 minutes when Collins was helped from the field with a knee injury. This prompted another reshuffle with Gormley moving to the wing, Wood to full-back and Evans returning to the back row. Melton pressed within Scouts’ 22 and were awarded a penalty for offside at the ruck which Cox converted for a 10-3 lead. Northampton countered strongly and a kick to Melton’s 22 saw the visitors penalised for holding on. The resulting penalty closed the gap to 10-6. Soon after Belcher was yellow-carded for playing the ball on the floor and a third penalty brought the hosts back to 10-9. After 65 minutes Melton then found themselves trailing again as another penalty was converted after the visitors were penalised for not rolling away after the tackle. The away side then produced their best rugby from their own line as they battered Northampton away, guided by Stone and Radford. Gormley broke left to Northampton’s 10-metre line and forced a penalty which Cox kicked to touch. Belcher returned to take the lineout ball which was quickly released by Rose who arrived at a ruck 10 metres out. His clever reverse pass to Stone broke the defence and the pass was returned to allow Rose to finish off a well-worked try. The speedy Northampton centre charged down Cox’s conversion, but Melton held out for their first win in three. * On Saturday, County Cup holders Melton travel to Oakham for a quarter-final tie. Kick-off is 2pm and all support is welcome. Melton: K. Stone, M. Badham, D. Osbourn S. Badham, A. Chambers, D. Evans, L. Gormley, S. Peters, C. Rose, M. Cox, A. Brooks, C. Prior, K. Radford, H. Wood, H. Green, G. Collins, D. Belcher, C. Loveday.